Engraving or branding stemless glasses is a great idea for a one off event or company logo. Branded stemless glasses can be given away after use. Stemless glasses are the perfect addition to your glassware collection or giving as a gift or wedding favour. They are sturdy, practical and great for use at special occasions such as birthdays and weddings or for small or large gatherings. 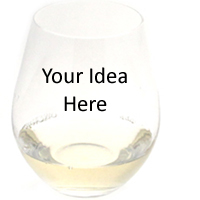 You can design your own stemless wine glass(es) to mark that special occasion. Glass engraving websites will give you the option to choose a pattern or artwork for your stemless glass. Some companies will also let you upload your own design! Choose a brand you like. (For instance if you are a fan of Riedel the Riedel O Range offers a fantastic selection of stemless glasses). How many stemless glasses do you require? If you are ordering for a special occasion or party we advise adding another ten to fifteen glasses to your order (depending on your order size) in case of any breakages which could occur during transport or on the day. Consider the occasion for your stemless glasses and whether you want the design to match the occasion. Make sure you leave ample time to design, produce and deliver the stemless wine glasses. Read all of the product information and details to find out exactly how long the order will take to process and complete. Our general tip is to place your order 4-6 weeks before the glasses are needed (this is only a guideline). If you need help choosing a design for your stemless glasses we have added our suggestions based on the occasion below. If your occasion is not listed then please feel free to contact us. Wedding favour – the design could be the date of the wedding and the names of the bride and groom. You could also choose a picture to represent the wedding day such as a ring or a pair of doves. Bridal shower – this can be a great present to give to your guests at a bridal shower. Each glass can have the date of the bridal shower and a photograph such as a wedding hat or any other picture that you would like. If you are giving a glass to each of your guests you could get their name engraved or initial of their first name. Stemless wine glasses make for a memorable item that your guests can take away with them (and be used when you next get together). Baby shower – stemless wine glasses are the perfect way to mark a special occasion. You can choose from a great range of designs for your baby shower stemless glasses such as a dummy, a baby crawling, a rocking horse, hand silhouettes and either ‘it’s a boy’ or ‘it’s a girl’ written on each glass. Birthday gift – if suitable, you can have the age of your recipient engraved on the stemless wine glass. This can be a brilliant idea for milestone birthdays (18, 21, 50 etc. ); which will be remembered for years to come. If the stemless glass is for a close friend then you could opt for a quote you which you both share engraved on the glass. You can make your stemless wine glass design personal and unique. Some companies have a selection of quotes and everyday phrases which can be printed on the glass. Anniversary – mark your special anniversary with a stemless glass. You can have the date you both met, your wedding day or any other special date engraved on the glass. Your loved one can cherish the anniversary as well as the glass! Stemless wine glasses are truly timeless elegance perfect for any glass collection. Club or society – if your club, society or organisation has a logo then why not get this engraved on your stemless wine glasses. Nothing says unity better than matching stemless glasses! Bar or restaurant – remind guests where they are drinking! Have your company logo, address or perhaps slogan printed on a stemless wine glass. A treat for yourself – Have your favourite phrase, saying, date or picture engraved on a stemless wine glass. A welcome addition to your glass collection and you will know it is definitely your glass! Dinner party – you could buy personalised stemless wine glasses for a dinner party or table setting. Have your name and dinner party date engraved; your guests certainly won’t forget your evening. If you need any further advice or tips for designing your own stemless glass then please contact us directly on 01903 786148 or fill in our online form. We can advise you on stemless wine glass designs and/or offer our personalised wine glass engraving services.